Bulk'o'media. A large, glare-free screen fused with solid workmanship and good application performance plus a midrange graphics card from AMD for the occasional game and business-ambitioned input devices. 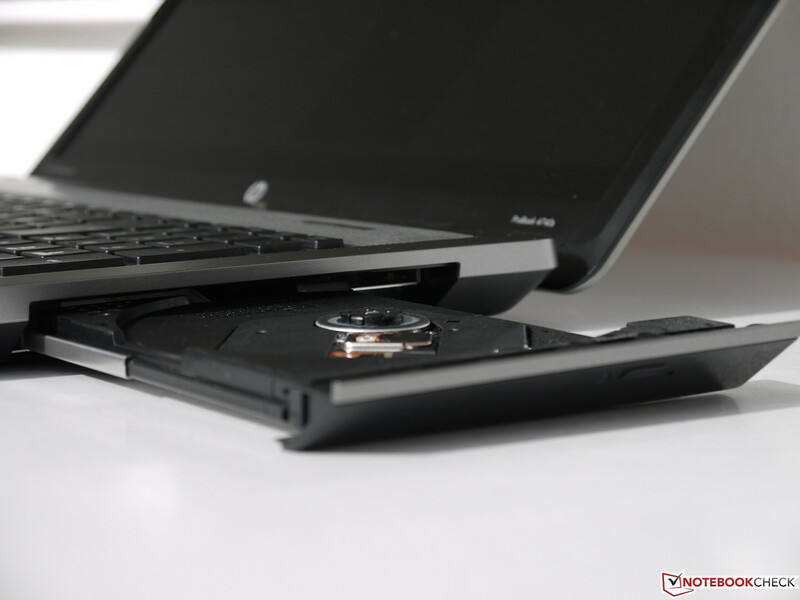 Will the ProBook accomplish the balancing act between business and multimedia? 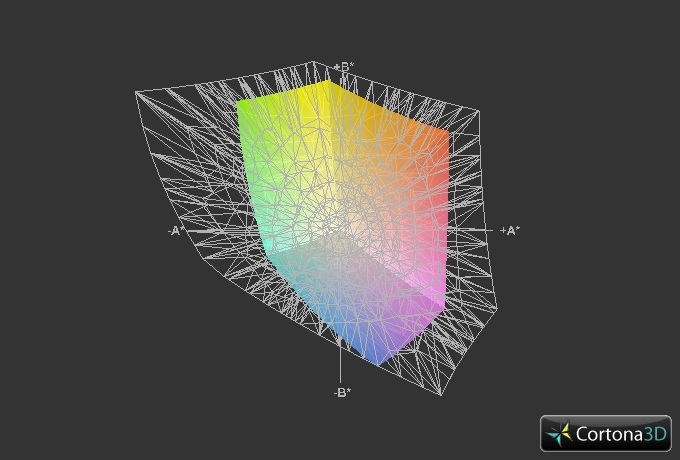 There are not many options available when looking for a matte 17.3-inch size screen. 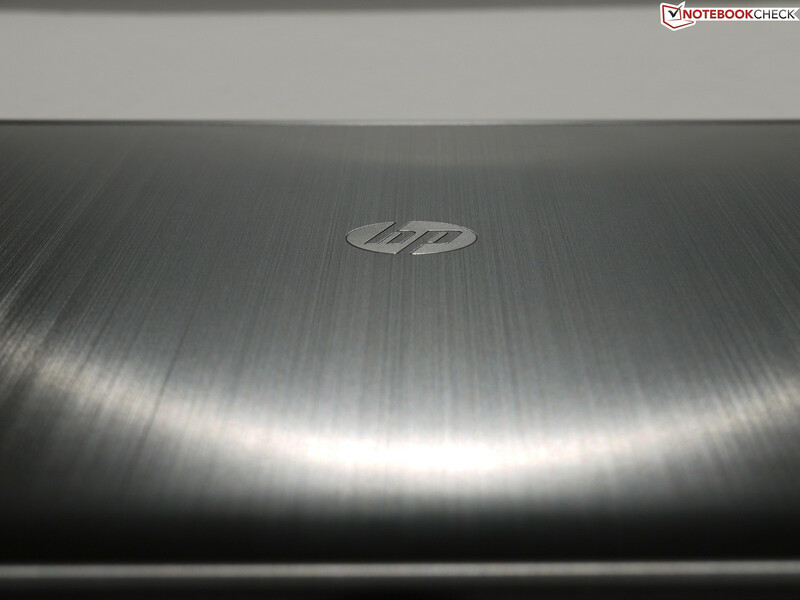 This is exactly where HP positions its ProBook 4740s. Dell's Vostro 3750 also plays in this league, but starts at a lower price. 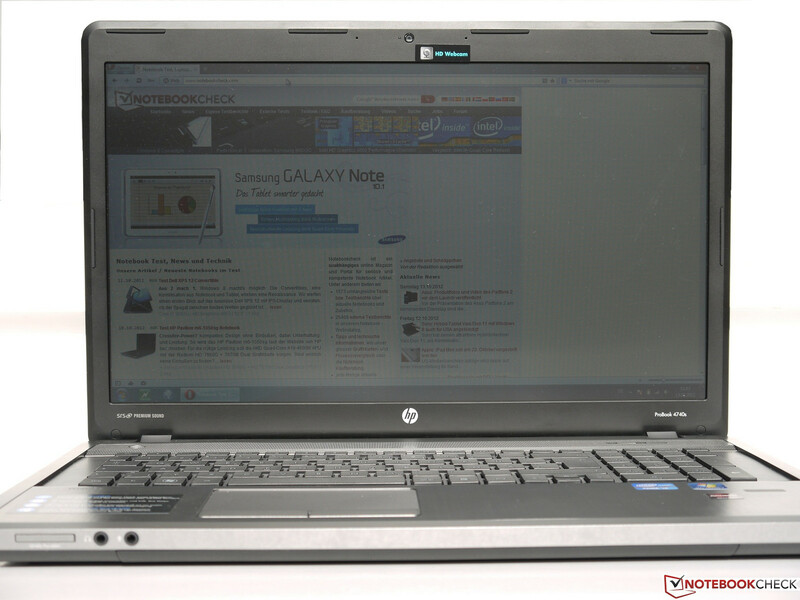 Notebooks such as Toshiba's Satellite Pro C870 or Acer's TravelMate 7750 also sport a large, matte screen. However, they cannot compete with the ProBook's workmanship and keyboard. The TravelMate P range does not yet feature a 17-inch model. Find out how the ProBook 4740s performs compared with its few contenders and if swapping it for the prior HP ProBook 4730s is worthwhile. The design has not changed much compared with the precursor. 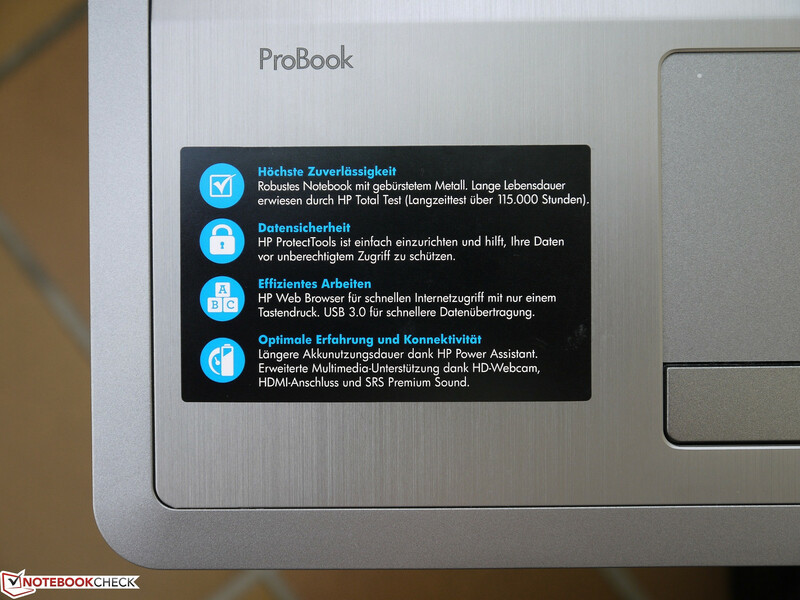 The ProBook 4740s has only been given a minor facelift. For example, it now features rounded edges that let it look slimmer in contrast to last year's model that looked a lot bulkier. This fortunately does not affect the casing's stability. 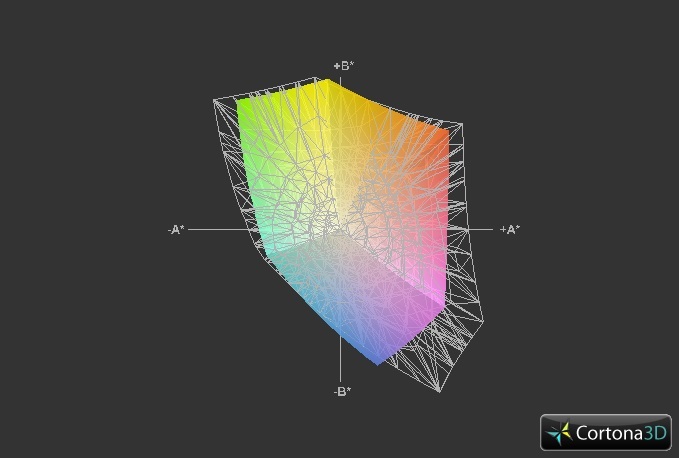 It still convinces with a high torsional stiffness. 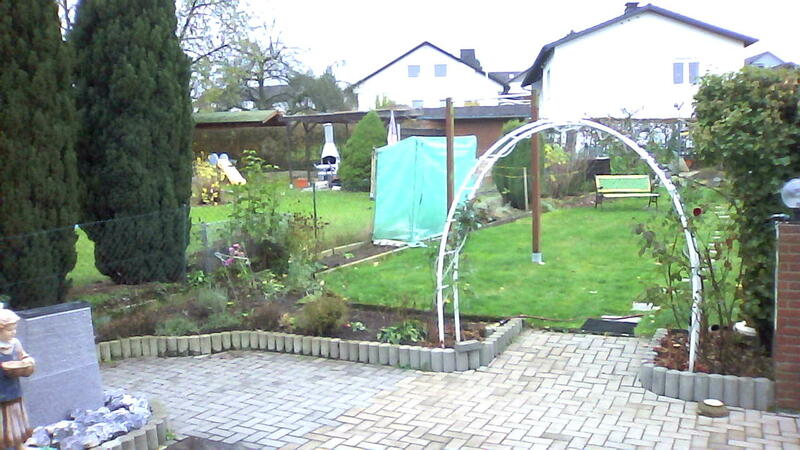 The choice of materials has not been revised either. Thus, the main materials remain plastic and brushed aluminum. The 17-inch laptop weighs 3070 grams (~6.8 pounds), which makes clear that portability is not primary here. We also discovered a few drawbacks with the casing. The wrist rest dents easily, though only marginally. 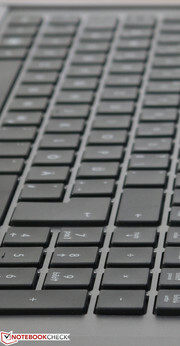 Moreover, the casing creaks when pressure is applied on the keyboard's left. 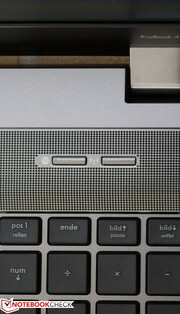 Furthermore, the keyboard tray can be pushed down a few millimeters without having to remove a screw. The speaker's grille on our test device is also not properly glued and lifts in some places. However, it can easily be pressed into place again. The display lid is made of brushed aluminum and is rigid enough to protect the screen. Two massive-looking hinges keep the screen in place. They are however only plastic. Nevertheless, opening the lid is possible using only one hand. But a slight teetering has to be accepted in return. At first glance, nothing has changed in connectivity or positioning compared with the 4730s. But when looking closer you will not find the ExpressCard/34 slot that, for example, enabled adding interfaces. 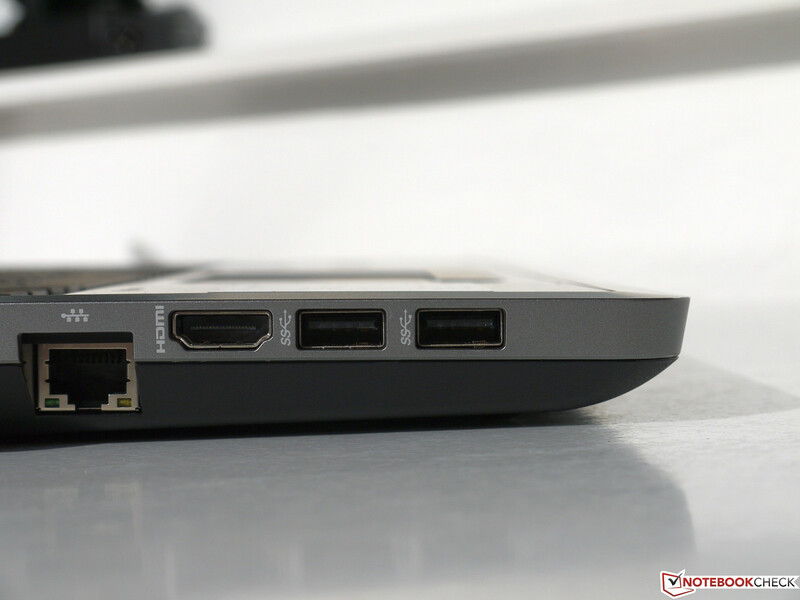 Also, the two USB ports on the left now support the USB 3.0 standard. The SuperSpeed logo beside the ports refers to this. The card reader is on the front and supports SD, MMC and MemoryStick Pro cards. Beyond that, the ports on the left have been moved a bit more to the front. We have already criticized the port placement in the precursor and thus are not happy with it in the latest model. Positioning the audio ports at the sides would also have been more convenient for connecting external speakers. No interfaces are placed at the rear due to the long battery and the hinges. The power socket, network port and at least one video out would have been handy here. The communication equipment is up-to-date and hardly leaves anything to be desired. The Internet can be accessed via Atheros's AR9485WB-EG Wireless Network Adapter, which supports the 802.11 a/b/n standards. The network can also be accessed using an Ethernet connection should a wireless router not be available. Realtek's PCIe GBE Family Controller enables transmission speeds of up to 1000 Mbit/s. Atheros' AR3012 module provides the energy-efficient Bluetooth version 4.0 for data sharing with other mobile devices. 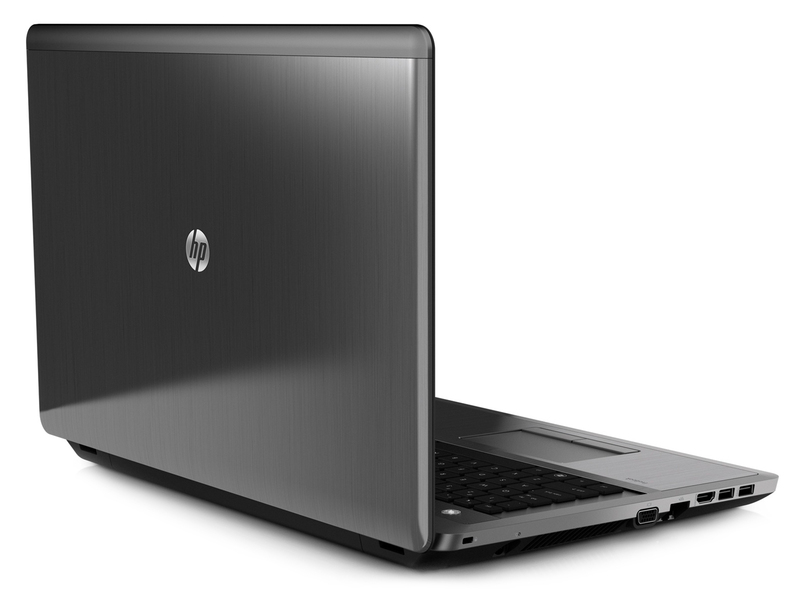 HP's DriveGuard protects the user against data loss when the laptop is dropped by momentarily stopping the disk's read heads. The device also sports a Kensington lock to protect it against theft. A fingerprint reader is optionally available but is not part of our test configuration. Apart from the most necessary accessories such as the battery and PSU, merely a bit of printed information, for example a quick start guide, is included in the scope of delivery. The user is responsible for creating a recovery medium and is also prompted to do so after a few days. HP’s maintenance solution is exemplary and does not use any screws. Merely two sliders on the laptop's bottom have to be moved. Pushing the slider to the center position only releases the battery lock. 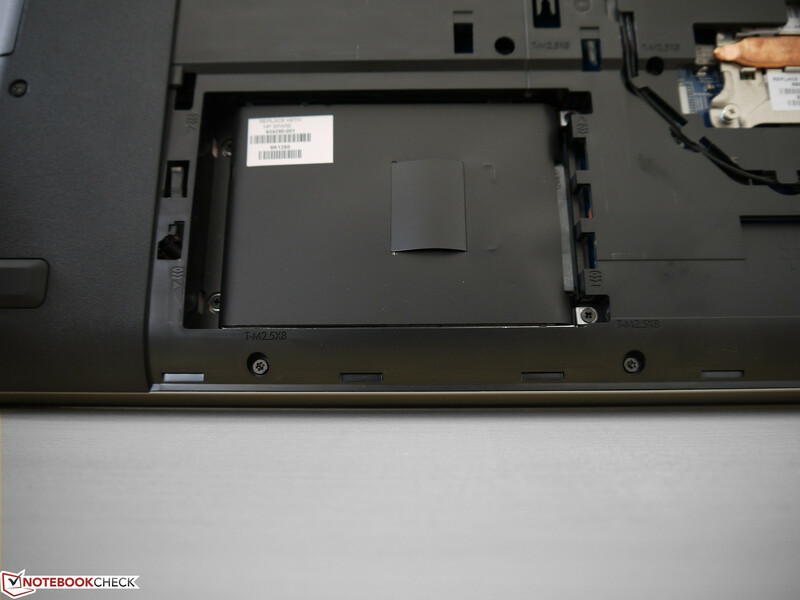 However, both the battery as well as the maintenance cover can be removed when the slider is pushed to the stop. 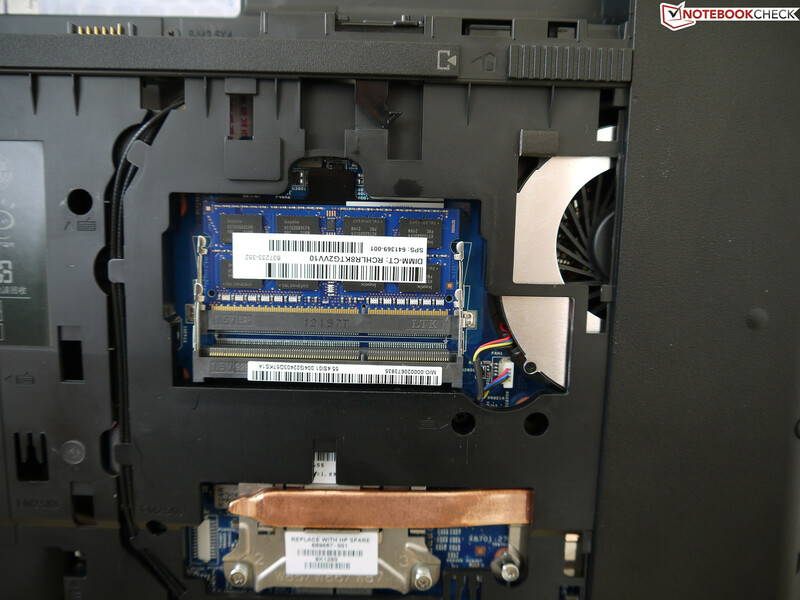 It is possible to access the working memory, Wi-Fi module and hard disk underneath the maintenance cover. Moreover, a part of the cooling system can also be accessed for removing dust and grime. 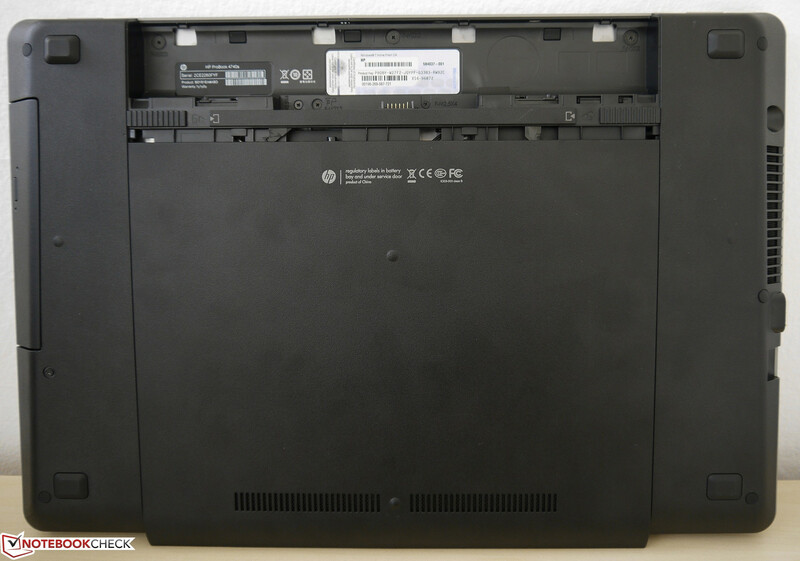 The standard warranty on HP's ProBook is 12 months and includes pick-up and return service. It is possible to upgrade the warranty to a period of 5 years for just under 200 Euros (~$255). A one-year warranty upgrade adds 45 Euro (~$57) to the purchase price. Data encryption should also not be omitted. The 15.3 mm (~0.60 inch) square keys are a bit small for a 17-inch laptop. Even a 13-inch subnotebook, e.g. Lenovo's ThinkPad Edge E330, features larger keys but not a number pad. 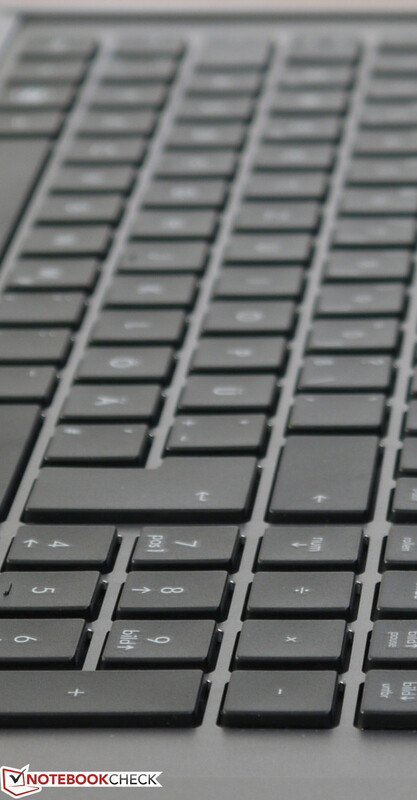 If you are used to larger keys, you will experience difficulties with the ProBook's keys at the beginning and make several typos. 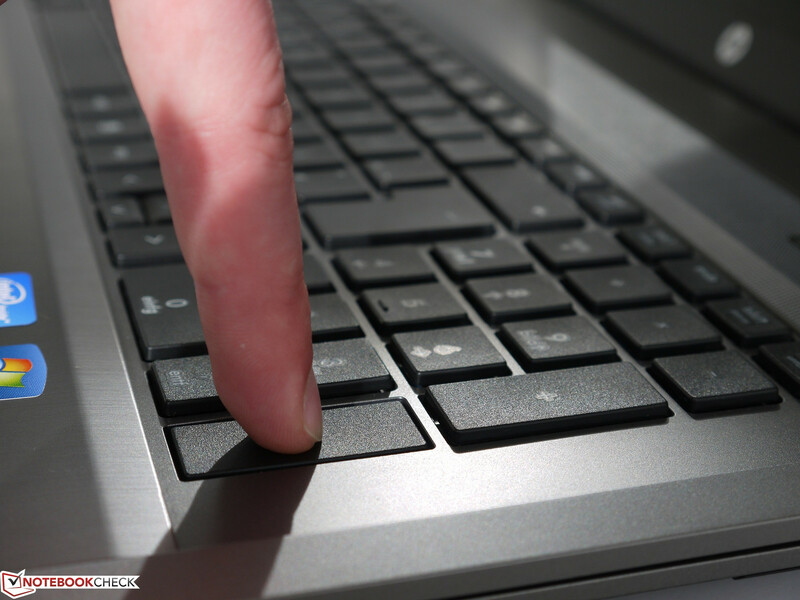 The up and down arrow keys were also viewed unfavorably because they are too small and tightly spaced. 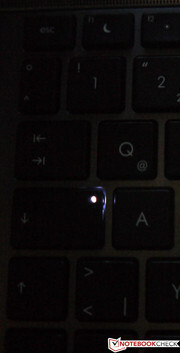 In return, the key drop and pressure point are quite satisfactory and the typing noise does not need to be reproached. 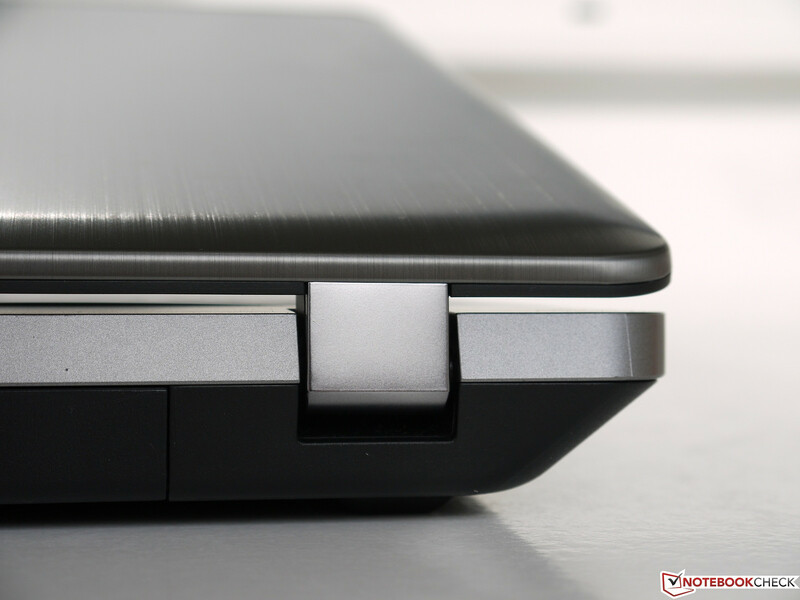 The laptop's wedge-shape is also a positive because it leads to an agreeable typing position. The 100 x 56 mm (~3.9 x 2.2 inch) touchpad has been marginally lowered into the wrist rest to create a better delimitation to the wrist rest. 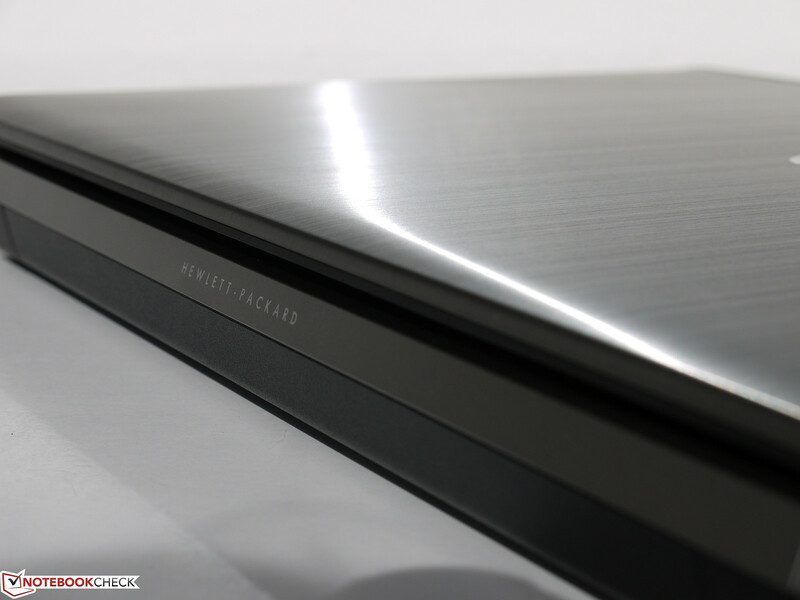 It features a sleek surface like its precursor. We nevertheless did not experience problems with input detection. It is also possible to navigate over the touchpad using two fingers as well as perform scroll and zoom due to multi-touch gestures. 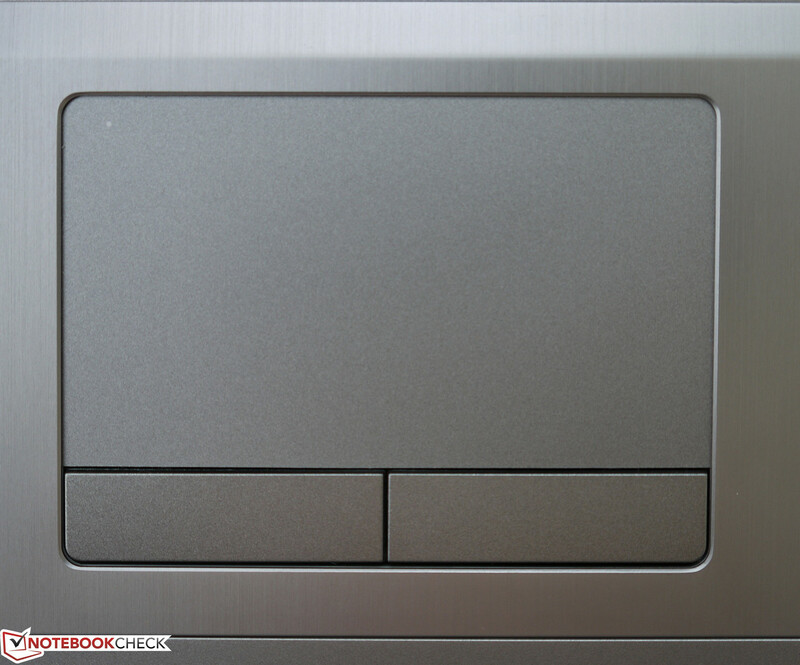 Also, the touchpad can be disabled to prevent accidental inputs while typing by double-tapping the upper left corner. 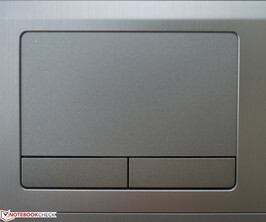 The key below the touch surface sports an agreeable size, clicks quietly and the key drop is well-chosen. However, the TrackPoint known from the expensive EliteBook is not available for the ProBook range. 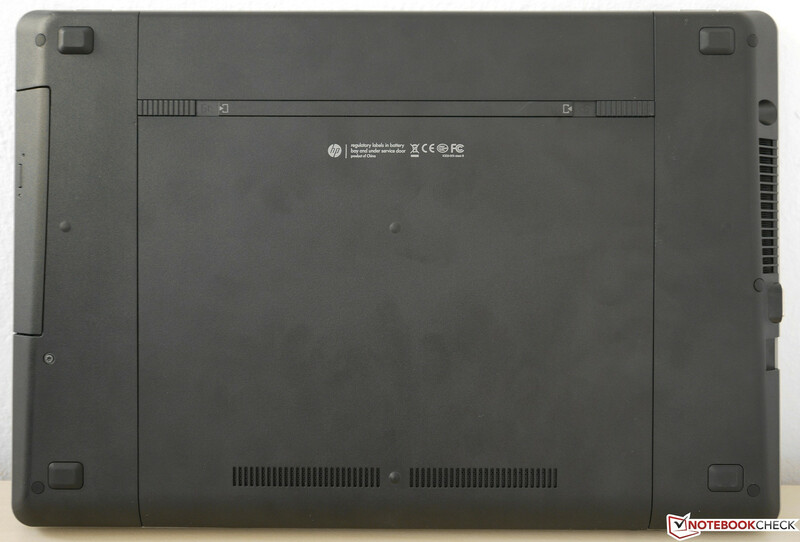 The 17.3-inch screen comes from LG (model: LP173WC1-TLD3) and is AR-coated. The screen's matte surface is a seldom seen in this size and price range. Screens using the cheaper TN film technology and white LED backlight are more common. A resolution of at least 1600x900 should be the minimum standard for a 17-inch device and does not surprise us. The illumination of 92% is compelling and does not exhibit brightness irregularities even on monochrome content. The average brightness of 216 cd/m² does not excel that of a standard screen and it is also available on battery power. The contrast of 505:1 is decent and lets colors look more vivid than on standard screens with a contrast below 200:1. The relating black value of 0.44 cd/m² is also good and provides a more saturated black that is especially pleasing in dark movie scenes. 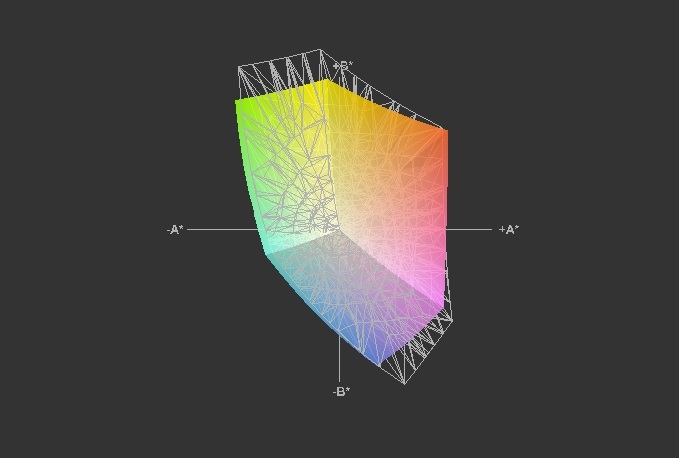 The test device's color gamut already clearly fails the sRGB color space and is consequently very remote from the Adobe RGB color spectrum. However, this was to be expected in this price range. Professional graphic designers are well-advised to look at higher priced 17-inch laptops. In return, normal users should not experience any significant disadvantages with that. 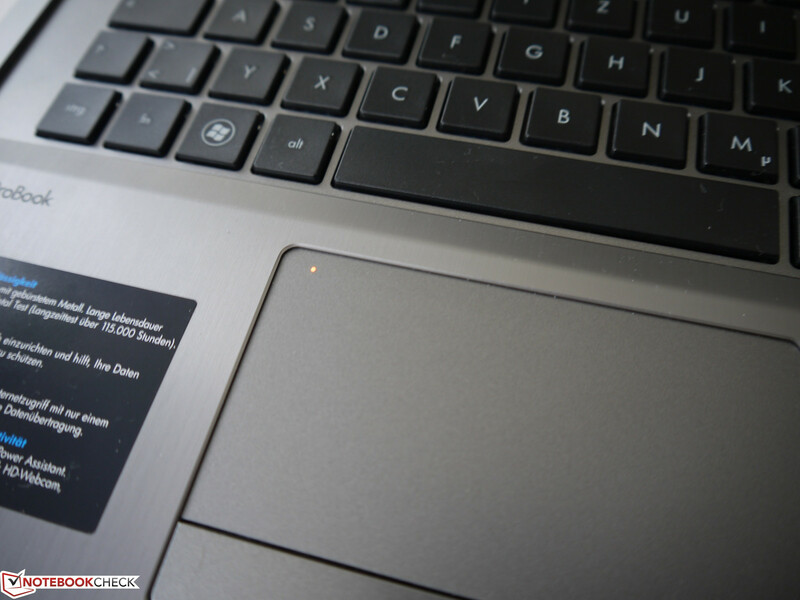 The laptop is not suitable for outdoor use in bright sunlight despite its low-reflection screen because the rather low maximum brightness ruins any plans in this direction. Although the screen remains well-readable in direct sunlight owing to the good contrast, it is strenuous and fatiguing in the long run. Indoor use and shady places should not cause problems. The horizontal viewing angles are quite decent for a TN screen. It is even possible for three people to look at pictures almost without contrast loss. The vertical viewing angles are similar to those of other TN screens. The black value and contrast decrease visibly when looking up on the screen. In return, the colors invert massively when the screen is tilted toward the back and text even becomes illegible. 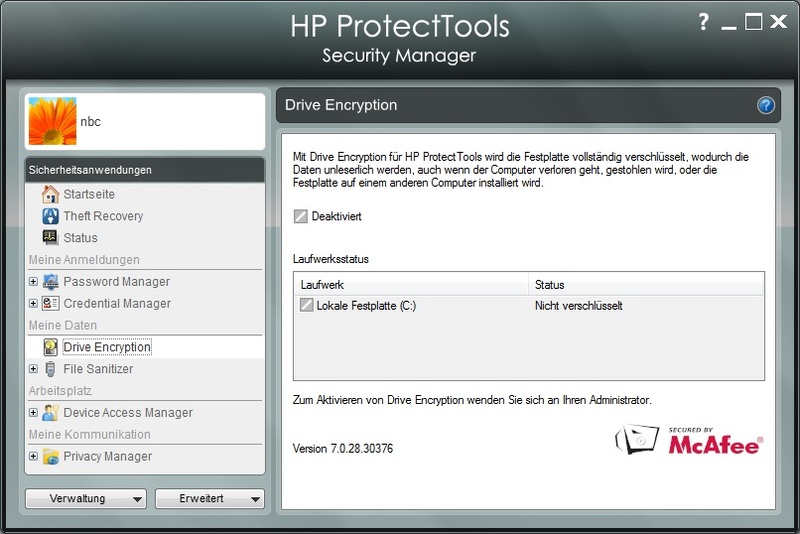 HP offers only a few configurations in Germany. 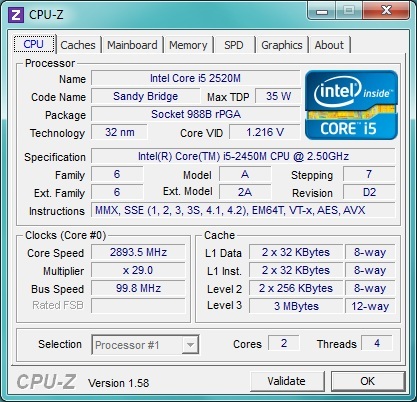 The Ivy Bridge Core i5-3210M and Sandy Bridge i5-2450M, both with a clock speed of 2.5 GHz, are currently available. All configurations sport AMD's Radeon HD 7650M graphics card, but either with a 1024 or 2048 MB VRAM. The hard disk equipment ranges from 500 to 750 GB and the volatile memory is designed with 4 GB. 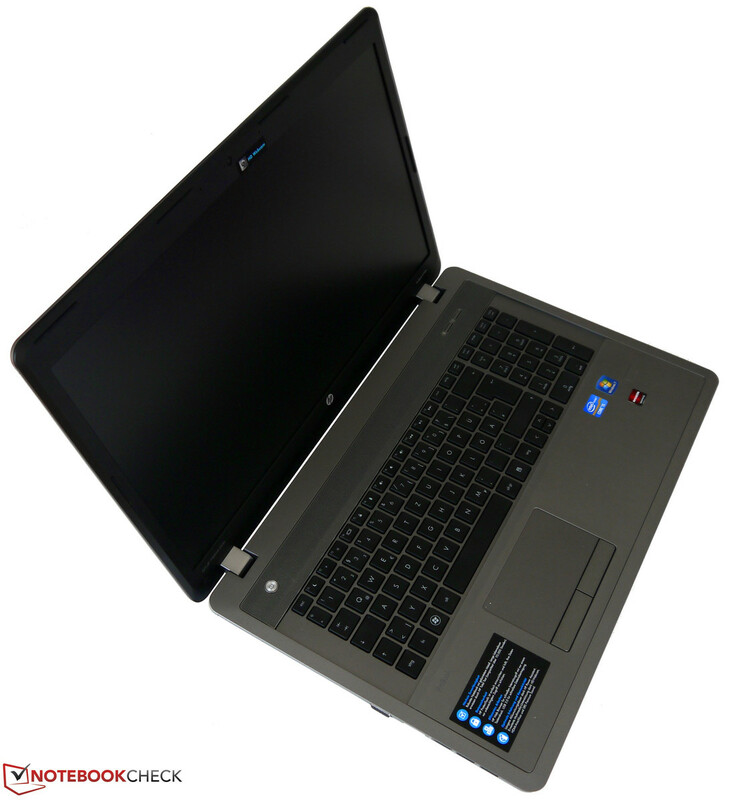 The ProBook 4740s configurations are thus all on the same performance level and provide enough power reserves for office, Internet, image editing and even HD video editing will not overtax the systems. Intel's Core i5-2450M processor with a maximum thermal power loss (TDP) of 35 Watts is inside our test model. 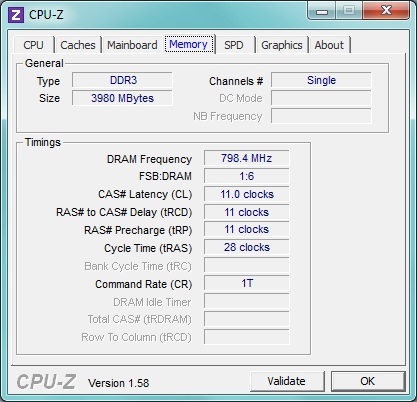 The CPU built in 32 nm has a default clock of 2.5 GHz. However, when more power is required, Intel's Turbo Boost technology increases the clock up to 3.1 GHz in single thread applications. 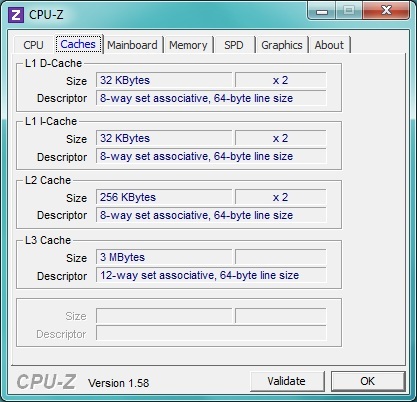 The processor clocks with a maximum of 2.9 GHz when both cores are loaded. The CPU multi 64-bit performance of Cinebench R11.5 benchmark increased by 6% compared with the 4730s as we expected. 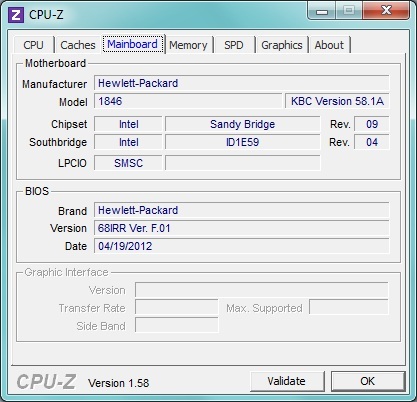 The i5-3210M Ivy Bridge processor achieves a 4% higher score. While the CPU's performance difference is only marginal, the new graphics unit renders 31% faster than the HD 6490M in the former model. The maximum performance is not available on battery power and Cinebench R11.5 finishes with 2.4 points in the CPU multi 64-bit test. That equals a performance loss of 13%. The reason for this is the disabled Turbo Boost function. The PCMark benchmark allows conclusions about the system performance. It runs through various preconfigured application scenarios and subsequently rates them. Our test system did not score quite as well in PCMark Vantage with 6541 points. 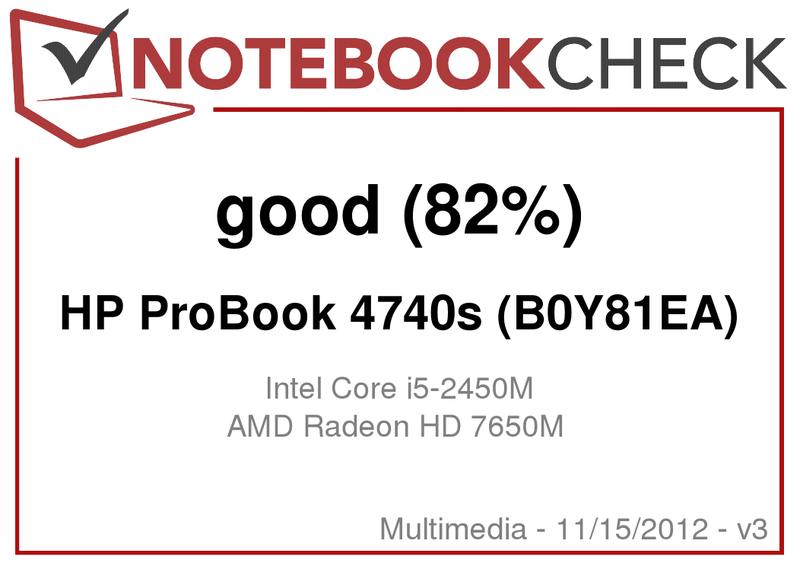 However, similar configurations are on the same level, for example the ProBook 4730s finished the test with a 4% lower score. Dell's Vostro 3750 contender lagged behind by 12%. The test configuration however only sported an i3 processor. 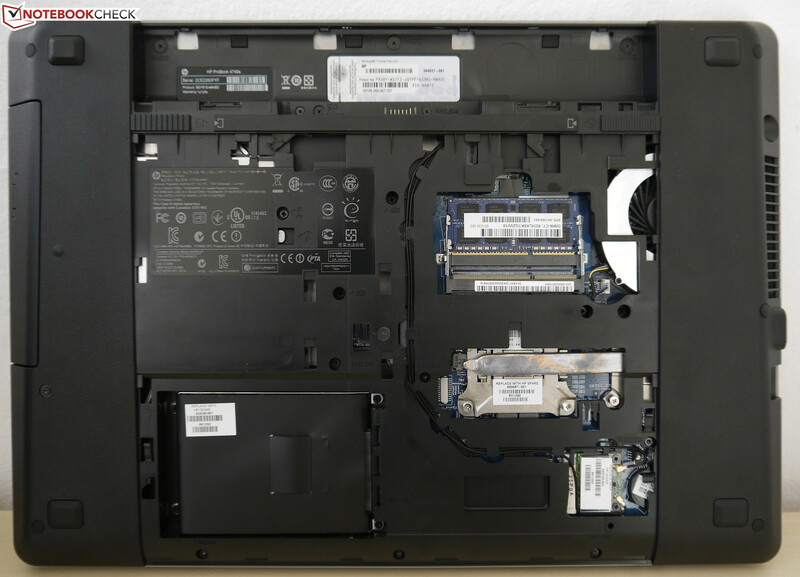 Lenovo's IdeaPad G780 alongside an i5-3210M CPU only achieved a slightly higher score of 6715 points. This did not look different in PCMark 7 and resulted in 1907 points (ProBook) to 1933 (IdeaPad). The storage device in our test model comes from Hitachi and is dubbed Travelstar 5K750. The disk spins with 5400 rpm and has a capacity of 750 GB, so the user still has a good 640 GB for personal data. However, the Travelstar needs a bit longer for writing processes. 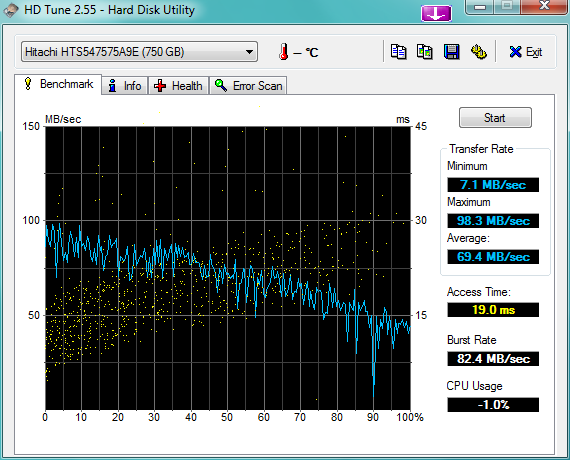 The hard disk benchmark HDTune recorded a slightly below-average transfer rate of a mere 69.4 MB/s. The access speed of 19 milliseconds is not compelling either. Even a comparably slow solid state drive (SSD), such as SanDisk's SSD P4, reduces the access time many times over and accelerates the system noticeably. Thus, investing in an SSD would be recommendable. 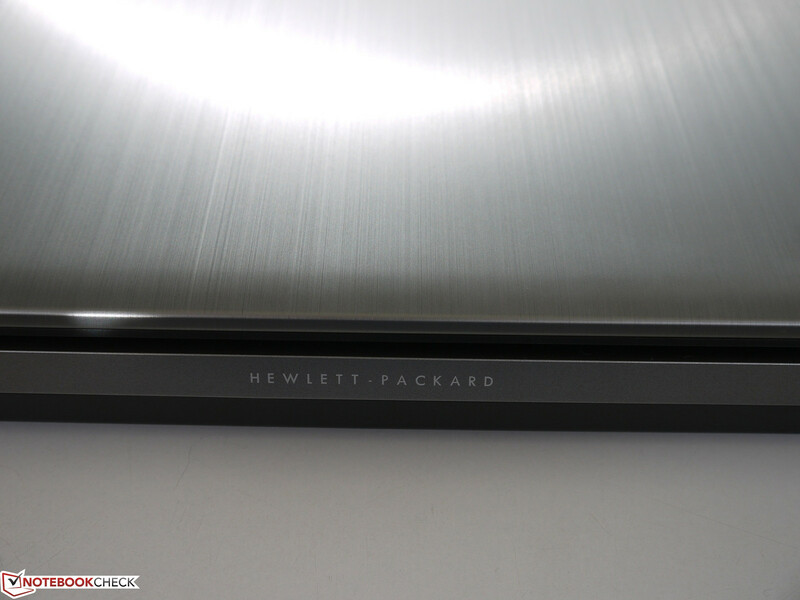 But it would have to be installed by the user since HP does not yet offer a configuration sporting an integrated SSD. The exchange can be performed quickly due to the good maintenance possibility providing that a recovery data carrier was created beforehand. Our test model sports two graphics units that can be selected via graphics switching. The option "energy-saving" in AMD's system control enables the CPU-integrated Intel HD Graphics 3000, while "high-performance" switches to the much stronger AMD Radeon HD 7650M. Although application-specific assignment should happen automatically, it did not always work perfectly in our test device. Consequently, we had to manually select the option "high-performance" in the graphics settings for the intended application. While Intel's chip is now built in 32 nm, AMD's chip is still manufactured in the older 40 nm process. The Radeon HD 7650M nevertheless positions itself as a lower midrange graphics card for office and multimedia laptops. AMD's GPU reaps in 1049 points in the latest 3DMark 11 for graphics cards featuring DirectX 11 support and thus achieves a plus of 36% in contrast to its 4730s precursor. Nvidia's GeForce GT 630M is on a par with that. However, AMD's Radeon HD 7670M is 13% stronger. As in the Cinebench benchmark, the performance is reduced on battery power in the 3DMark benchmark. Thus, the 4740s has a 5% lower performance in 3DMark Vantage. A quick look at the pure gaming performance shows that AMD's Radeon HD 7650M's power is at most enough for casual gamers. The quality settings could only be pushed to medium in the native resolution (1600x900) in FIFA 13, without affecting the gameplay. It is even possible to enable all graphics options in this game without provoking jerky frames. The graphics soon have a hard time in games with very high graphics requirements, such as the first-person shooter Medal of Honor: Warfighter or Battlefield 3, and these tracks are only really playable in a low resolution (1024x768) and minimum image quality. However, we could play all tested games smoothly with minimum quality settings. More games that are playable on the Radeon HD 7650M can be found in Gaming Performance of Notebook Graphics Cards. It is annoying that the fan never stops even in idle and is also very audible with a minimum of 33.4 dB(A) in energy-savings mode. The fan even reaches 35.3 dB(A) without load when Windows energy-saving "high-performance" profile is selected. We recorded a noise level of 35.2 dB(A) when we loaded the system with the 3DMark 06 benchmark, which gets annoying after a while. The fan even speeds up to 41.7 dB(A) during full load. However, this state was prompted by 100% CPU and GPU load via Prime95 and FurMark and was not achieved during the gaming tests. The BIOS does not have an option for disabling the fan, but it could be included in a subsequent update. Since the fan in the 4740s runs even when idling, heat is not accumulated and the laptop's surfaces remain cool all over. However, our full load temperature assessment shows that this is not only owing to the permanently running fan. We measured a maximum of 44 °C (111.2 °F) on the bottom at the air outlet area during this scenario. The other areas remained inconspicuous. The wrist rest never got hot in any test situation and using the device on the lap was easily possible. We did not observe a CPU and GPU throttling even after a multi-hour stress test (100% CPU and GPU). Also, the system did not show any irregularities in a subsequent 3DMark test and it provided the same results as before the stress test. A logo on the display's bezel boasts "SRS Premium Sound". However, it is not a sound system that features a subwoofer but only sound enhancing software. Seen subjectively, we achieved a better sound without the enhancer because the system's default emphasizes the trebles too much. Regardless of the software settings, the bass remained very thin and we did not perceive any changes regarding this even when the enhancement system stayed off. In return, the sound system's high volume and the clear playback at maximum volume are pleasing. It is also still possible to connect an external speaker via the 3.5 mm jack or the digital HDMI port for a better sound. These options did not show any irregularities during the test. Although the CPU and GPU performance has increased compared with the precursor, the power consumption has dropped. The behemoth exhibits exceptionally low power consumption for a 17-inch device with 7.3 to 14.7 Watts when idling (4730s: 12 to 18.4 Watts). However, we measured a maximum of 59 Watts in the stress test (100% CPU and GPU load) where the Radeon graphics and full brightness are enabled. This is a very good rate in view of the strong system and can even compete against multimedia laptops featuring a 15.6-inch screen size. 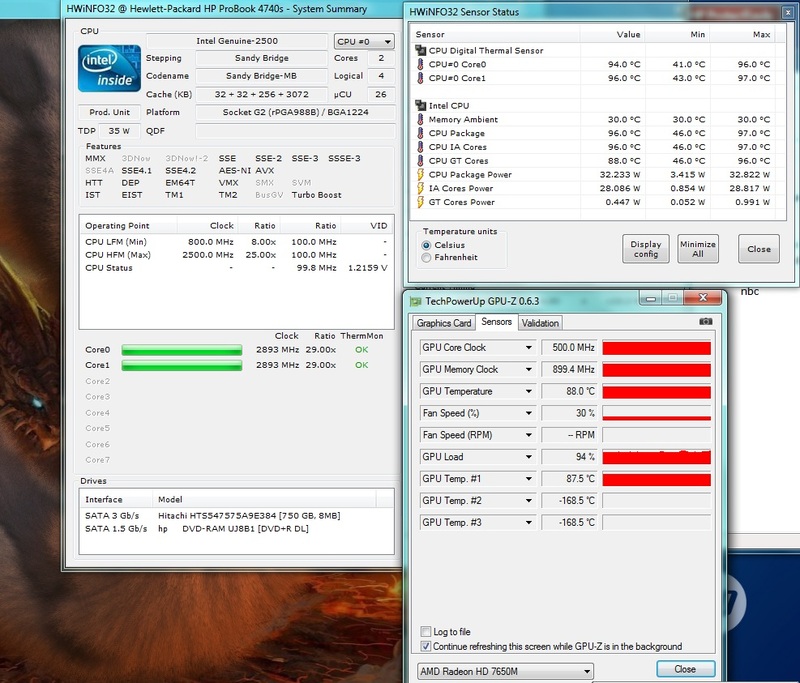 The precursor consumed 16 Watts more in the same scenario although it sports a lower performance Radeon HD 6490M. 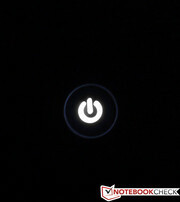 The gaming power consumption also proves to be very good. We ran the first test series of 3DMark 2006 for this and measured an average of 44.4 Watts. The PSU generates up to 90 Watts and thus does not have any problems recharging the battery even when the system is loaded to maximum. 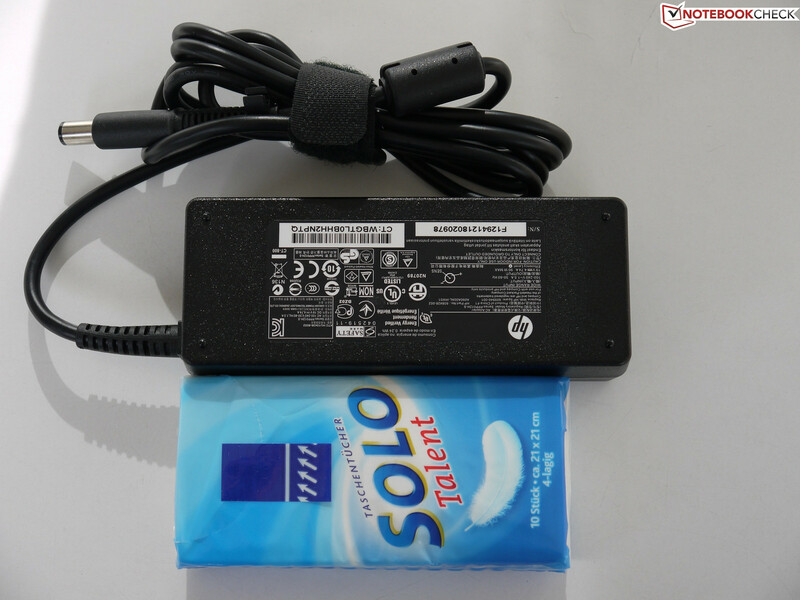 To achieve the longest possible runtime away from the mains, HP treats the ProBook to an 8-cell battery with a capacity of 73 Wh (5100 mAh, 14.4 volts) ex-factory. Thus, good results can be achieved alongside the low power consumption. If you deem a 15-inch laptop too small but do not want to waive on a matte screen, you will not have much choice in this price range. If you are also looking for a solid 17-inch device with high performance reserves and a good battery life, you will find this in the 4740s. 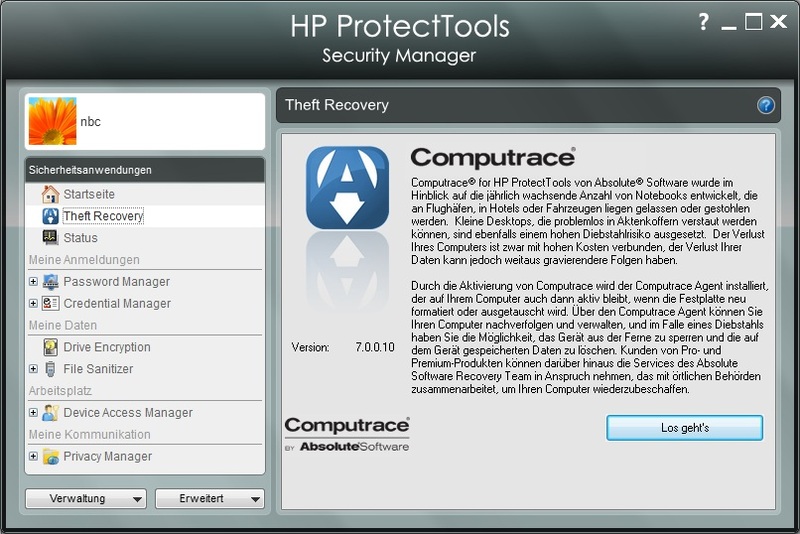 HP has also included a few business features, such as the DriveGuard and the decent keyboard. The ProBook 4740s C4Z55EA model sports the newer i5-3210M Ivy Bridge processor and is listed in roughly the same price range. Thus, this model should be preferred over ours. If you do not want to spend this much, you can take the version with a 1 GB VRAM and save 80 Euros (~$102) or reinvest it in an SSD. 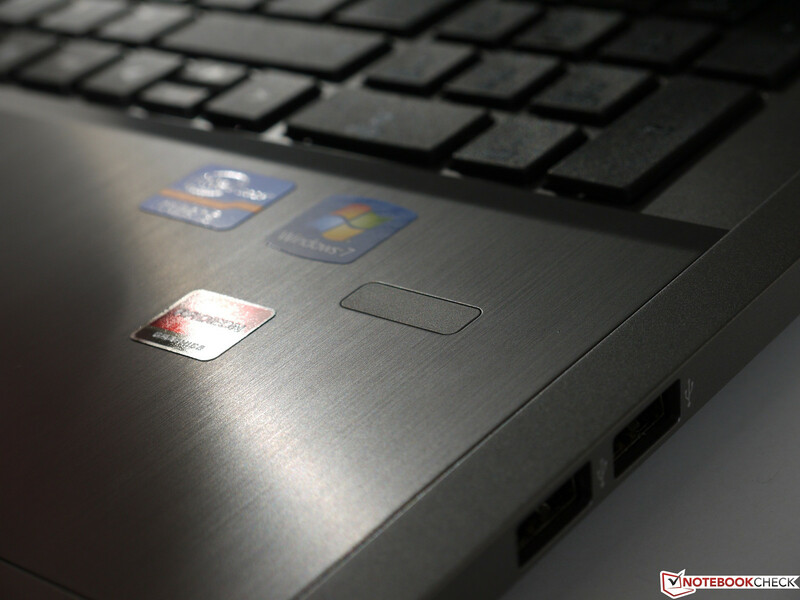 The ProBook sporting AMD's Radeon 7650M is not a gaming machine at any rate. 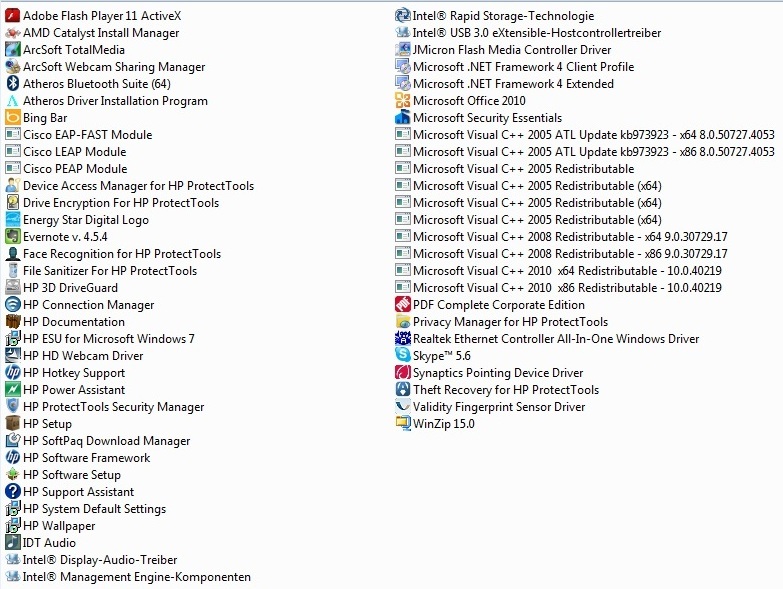 HP now has a more balanced mixture in its array, which is not perfect in any field but can do a lot of things decently. 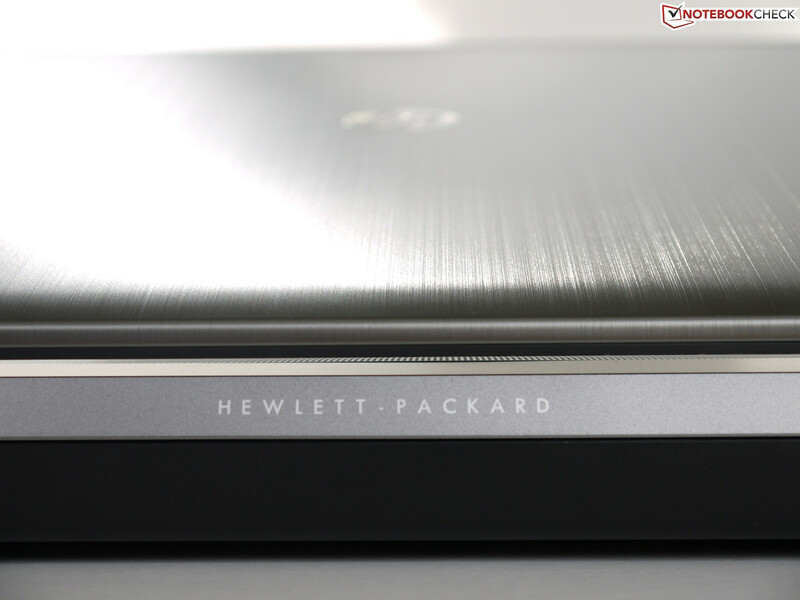 Thus, replacing HP's ProBook 4730s is not worthwhile if you are happy with the battery and graphics performance because these are the only two points where the 4740s is superior. An alternative for our test device and its precursor is, for example, Dell's Vostro 3750 that was especially praised for workmanship and mouse replacement, but was inferior in terms of battery runtime and screen. 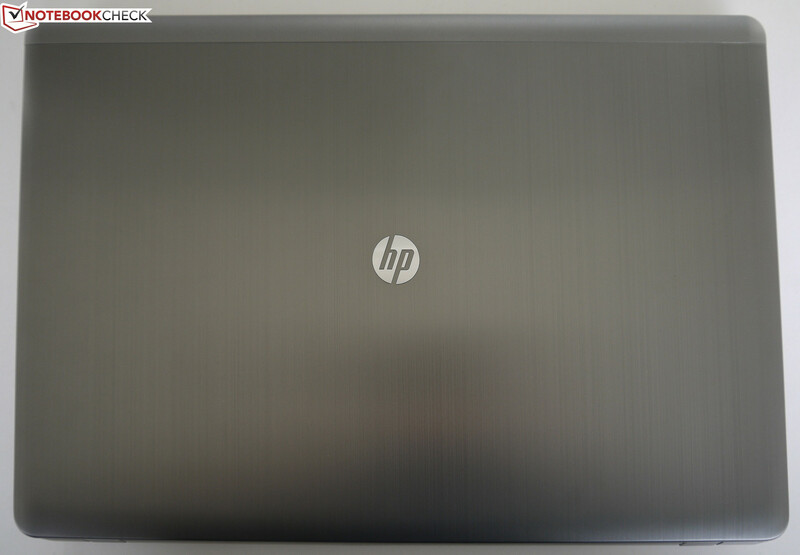 If you do not insist on a matte screen, you might look at HP's Pavilion dv7-7000sg. However, its screen exhibited poorer contrasts. Lenovo's G780 and Packard Bell's EasyNote LS11-HR cannot compete here either. The latter provides more gaming power though. The USB 3.0 ports are not blue; they are labeled with "SuperSpeed" instead. A fingerprint reader is optionally available. 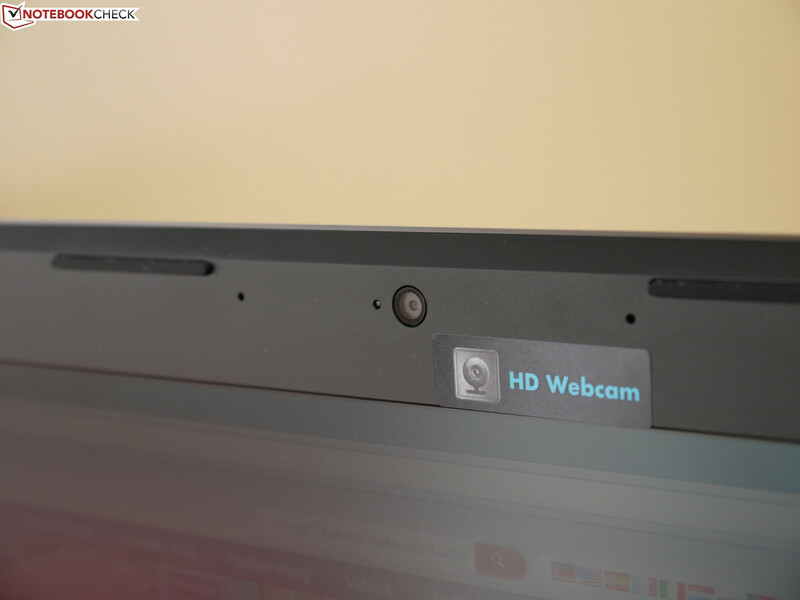 The webcam has a resolution of 1 megapixel and is capable of the lesser HD. The pictures are a bit overexposed but quite decent anyway. The bottom does not exhibit visible screws. Two sliders are enough to release the battery. and a 90 watt PSU recharges it. The maintenance cover is also released with the two sliders. The caps lock key also lights up when activated. and lights up in when on. and is made of brushed aluminum. and the color matches the display lid. but they are only plastic. The do not permit a wide opening angle. Then again, the wrist rest is aluminum. 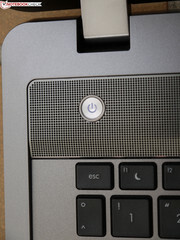 A small LED in the touchpad's corner lights up when it is disabled. The keyboard makes a decent impression. The pressure point is clear. The Wi-Fi and quick access browser button. and a part of the cooling system. Obviously, the value for money ratio because hardly any laptop features a matte screen and dedicated graphics at this affordable price. A Blu-Ray drive and a docking port which would make the fusion of business and multimedia virtually perfect. Despite the width of 41 centimeters, no interfaces have been placed at the device's rear.